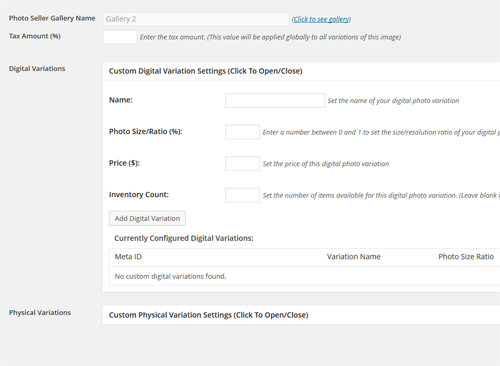 Normally, you configure a price list in the plugin and then you use it for your gallery. The price variations you configure in your price list is applied to all the images in the gallery. 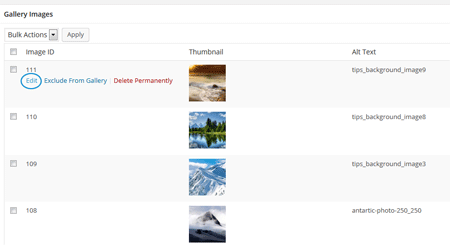 Step 1) Go to the gallery menu of the plugin and edit the gallery in question. Step 2) Scroll down to the “Gallery Images” section of this gallery. Step 3) Click the “Edit” link next to the image that you want to apply a special price variation for. Step 4) Add your special price variations for this image and save it. When the visitors are viewing this image from your gallery, they will see the special price variations rather than the one from the price list.